Live and Uncensored! : So This is How Facebook Sees Me. So This is How Facebook Sees Me. 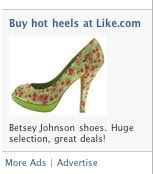 I was lying around feeling appalled and bitter about an ugly pair of shoes that Facebook apparently thought I'd find "hot," when I noticed a link marked "More Ads." One compulsive click later, I found myself at the Facebook Ad Board. This fascinating page contains all the ads served to me at any given time, based on input from my profile. Here's part of my Ad Board page. Right now the ads are seedy and hit-or-miss, probably based more on my gender and age than any other unique details. What beguiles me is the transparency of this ad board. It's probably a decent reflection of how well most websites interpret the information you provide. As your profile and the advertisers change, you can watch that interpretation evolve! In the context of the "you-are-as-the-'net-sees-you" mindset, which is growing in popularity (and by its own definition, fast evolving into an absolute truth), it won't be long now before somebody can viably argue that you are a reflection of what the Ad Board -- any ad board -- serves you. As a consumer, sure. By all means, ad guys, sharpen your targeting capabilities. Feed me cookies, track my eyeballs. Ads that I enjoy will improve my content landscape -- and generate more conversions for you. Philosophically, however, I'm not fond of the idea. I don't like thinking that what I am -- all the AWESOME that is ME -- can be distilled in a lovingly-terraced product grid. ...but that's just a conceit, isn't it? For the cult that believes we can only be defined by how others perceive us, it isn't such a big jump to assert "you are what Google says you are." And from there, it doesn't strike me as unreasonable to say you are defined by what you buy. Or by the ads you click on. All advertisers need are more sophisticated lenses. * Then, voilà: mirror to your soul. *They're getting sharper by the minute. Read about Phorm, which works with ISPs to track all your online activities, creating a more accurate collection of your loves and hates than Facebook could ever dream of eliciting from you. Nice post and well said Angela.. I couldn't agree more. When I experience that ugly-shoe thing, it reminds me of my old cat, who used to drop vermin at my door, because the shoes are about as wanted as dead mice on the front steps. The flip side of this is when Facebook or another ad network serves up an ad for a product that I actually DO like, I feel icky. That's like something out of "Sideways Stories from Wayside School." You know, because the dead rats are always trying to sneak in. With regard to actually liking the ads you're served -- and sort of hating yourself for feeling it -- I can see how that might blossom into emotional catastrophe over time. What's Your Incontinent Underpants Style?